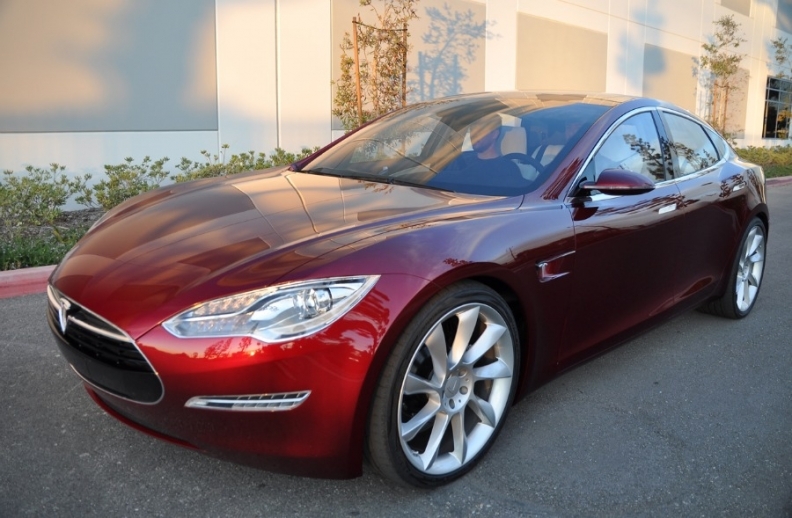 Tesla is planning a crossover EV based on platform used to make the Model S (shown). LOS ANGELES (Bloomberg) -- Tesla Motors Inc., the U.S. electric sports carmaker, revealed that its revenue this year may rise as much as 50 percent because of high demand for its rechargeable vehicles and battery packs. "We project revenue to increase about 40 to 50 percent in 2011, to $160 million to $175 million," Deepak Ahuja, Tesla's chief financial officer, said in a conference call. The company released annual results Tuesday for the first time since its initial public offering in June, posting revenue of $116.7 million in 2010. Tesla's forecast for this year exceeded the $152 million average estimate of six analysts surveyed by Bloomberg. Tesla said the fourth-quarter net loss widened to $51.4 million from $23.2 million a year earlier as it increased investment in the Model S sedan, its next all-electric model. Tesla seeks to become the leader in battery-powered cars, aided by supply agreements with Toyota and Daimler. Along with development costs for the Model S, the company is also readying a former Toyota joint-venture factory in Fremont, California, that is to begin making the $57,400 Model S next year. Tesla's initial goal is to sell about 20,000 units of the Model S annually. "It's a concern for me how quickly they'll be able to scale up, assuming demand for their vehicles meets the company's expectations," said Michael Yoshikami, chief investment strategist at YCMNet Advisors in California. "There's a lot of competition coming from companies that really have an ability to scale up -- Nissan, GM, even Toyota," Yoshikami said. Fourth-quarter sales rose 95 percent to $36.3 million, according to the company. The startup will benefit this year from battery-pack sales to Daimler AG for use in its electric Smart ForTwo minicar. Daimler, which owns 8 percent of Tesla, increased its order by 300 units to a total of 1,800 packs, Ahuja said. Tesla will also receive funds from Toyota Motor Corp. throughout 2011 for designing a battery pack, motor, transmission, charger and software for the RAV4 EV that goes on sale in 2012, he said. Toyota bought a 3.2 percent stake in Tesla last year. Tesla will follow the Model S with the Model X, a crossover vehicle built from the sedan's platform, Tesla CEO Elon Musk said. Given potential demand for an electric utility vehicle, it's "a way of generating twice as much volume in the premium vehicle segment," Musk said. A concept version of the vehicle will be shown by the end of the year, and Tesla is likely to raise as much as $150 million to cover Model X development costs, Musk added. Tesla already has sufficient capital to complete development of the Model S, he said.